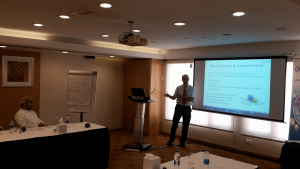 OceanWise delivered a 2-day MSDI workshop on Sept 11-12 at the Park Inn hotel, Muscat on behalf of the Oman National Hydrographic Office (ONHO) which examined the development, role and contribution of marine data to the Oman National SDI programme which is currently being developed. Decision makers from the ONHO, National Survey Authorities (NSA), Public Authority for Climatic Affairs (PACA), National Centre for Statistical Information (NCSI) and Royal Navy of Oman (RNO) attended providing a broad perspective on future shared working and co-operation. Sessions involved attendees discussing challenges associated with the key elements of MSDI; Content, ICT, Standards and Governance and the importance of data management “best practise” and its role in ensuring successful delivery of NSDI. ONHO, cooperating with its marine partners in government, is well placed to deliver its MSDI, a key element of NSDI in the next few years.